Established a little more than three years ago in 2011, uBinary has since expanded their market share after revamping their website in 2013. The additional of candlesticks charts is certainly a plus point since it greatly enhances a trader’s capacity to perform a more in-depth analysis of the price movements. 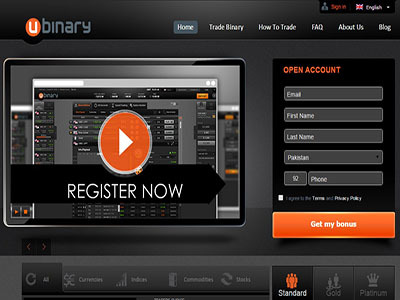 The makeover of uBinary’s website also helped to improve the overall trading experience. The layout now feels neat and organized and somewhat space-age, making navigation around the platform hassle free. What is really obvious about the revamping exercise is the fact that they really took effort to make themselves stand out from the rest of the pack. In this time of new brokers popping up every day that’s a key advantage in this busy industry. While most binary brokers prefer to go from well established white label platforms like those from SpotOption or Tradesmarter, uBinary prefer to take the road less travelled by opting for their own platform. This helps to account for the fact why uBinary’s platform look and feel so much more sophisticated from other binary platforms that we find in the industry. With their cumulative experiences in the Forex industry, one can understand why the uBinary’s platform is so easy to without having to undergo any training to operate it. With all the information clearly displayed, traders will have very little room for error. Currently, uBinary offer their traders two types of trading contracts, the popular Above/Below options and time sensitive options with short expiry times like 60 seconds, 120 seconds and 5 minutes. Ideal for beginners with a low minimum deposit requirement of $100 to open. In addition, account holders also get a 30% welcome bonus. Suited for the more professional trader. In addition to a 30% welcoming bonus, traders also get free signal service and personalize training. Tailored exclusively for traders with deep pockets and the need or personalized service. On the average, traders can expect a return of around 85% for their investments if they closed in the money. For out of the money trade, traders can expect a minimum of 10% back from the original amount that they invested. Although their market coverage is not as large as some of the leading binary brokers, uBinary’s asset list is still reasonably extensive covering 67 different types of assets. As for the reliability of uBinary, there are very little complaints in this department. The platform works great and their customer service is second to none. Traders have access to different methods such as credit/debit cards, e-wallet and bank wire transfer to deposit and withdraw their funds. We found uBinary to be a very transparent and reliable broker. Combined with the efficient platform, traders will definitely find uBinary to be a good match for them to work with.